We carry Medieval and Renaissance Shirts for the Event. We have the Celtic Shirt, Renaissance Swordsman Shirt, 15th Century Shirt, Yoke shirts, Pirate shirts and more. Come see what see have to offer. Made of soft light muslin, a full Men's Medieval 15th Century Shirt with long sleeves and small rolled hem at wrist. The collar ties at the neck. Shirt is long to hip length. The Aiel are a race of people who live in a desert, which they call the Three-fold Land. They have earned a reputation as skilled warriors. This 100% cotton Aiel Shirt is grey Choose S/M or L/XL. Whether a pirate or a cavalier, this cotton lace up Buccaneers Shirt is perfect for all occasions. The interfacing in the collar and the cuffs give a level of stiffness and support to keep the crisp look that you want. Made in USA. This simple, attractive early Renaissance shirt is made from a poly/cotton blend and is suitable for a wide variety of period outfits. Billowy sleeves, open neck, button closure at the cuff. Durable and cool, 100 % cotton Drop Yoke Shirt allows the air to flow freely. You can stay cool while appearing right out of the Enlightened medieval period. Machine Wash. The Classic Renaissance Shirt is made of 100% cotton which is soft next to the touch. We love this rainbow of colors! Full sleeves, tuxedo collar, and tie at the wrists and collar. 100% cotton muslin makes this a great shirt to wear alone or under your favorite doublet. This Cavalier shirt is made in a rich black cotton velvet with a lace-up neck. The slashed sleeves reveal either a silver or gold satin inner sleeve. The Child's Classic Renaissance Shirt is made of 100% cotton which is soft next to the touch. We love this rainbow of colors! Full sleeves, tuxedo collar, and tie at the wrists and collar. This Don Juan Shirt offers a look with period flair and impressive design. Made from black cotton, this mens Renaissance shirt possesses a tall, stand-up collar and a line of ruffles that run down the front. More ruffles appear along the cuffs of the long-sleeved dress shirt. This Courtly Ruffle Collar Shirt is a white period shirt offers the highest Tudor collar of any of our shirts. The collar has a hook & eye closure and both the collar and cuffs are black edged. Made of 100% cotton. Available in S/M or L/XL. Made of soft light muslin, a full Men's Early Renaissance Shirt, long sleeves with elastic at wrist and small ruffle ribbon drawstring tie at the neck for adjustable style. Shirt is long to hip length. Our Fleur de Lis Drop Yoke Shirt is a comfortable and easy to wear classic Renaissance Shirt. With a crisp clean look, embroidered gold Fluer de Lis this shirt can be worn to your Medieval, Renaissance or LARP events. Our John Coxon Pirate Shirt is made from thick and rich Viscose fabric. The sleeve has a long cuff with eyelets and drawstring. This historic shirt has a Pirate and Renaissance look. Our John Cook Pirate Shirt is made from thick and rich Viscose fabric. Eyelets with drawstring have been provided in front for easy wearing. The Sleeves have a ruffled cuff. This cotton shirt has button up cuffs and lacing in the front. Perfect for adjusting how much skin you show on the high seas! Our Half Cape Medieval Shirt has a charisma attached to it. Rayon fabric flows around your back and shoulders. Ruffles on the chest and cuff add to the flair of this bold shirt. Whether swashbuckling or flamenco dancing, you will do it with flair in this ruffled, rayon shirt. Our Francis Drake Pirate Shirt is made from rayon fabric. This shirt features a ruffle along the front of the shoulders as well as down the chest. A long ruffle at the cuff finishes the look. Our Heavy Cotton Shirt is hand woven and features a button neck, long sleeves, and a straight cut. Truly a comfortable and versatile garment. Our John Cook Pirate Shirt Plus Size is made from thick and rich Viscose fabric. Eyelets with drawstring have been provided in front for easy wearing. The Sleeves have a ruffled cuff. Our Half Cape Medieval Shirt Plus Size has a charisma attached to it. Rayon fabric flows around your back and shoulders. Ruffles on the chest and cuff add to the flair of this bold shirt. Our John Calles Pirate Shirt Plus Size is made from rayon fabric, this shirt is designed for those who have been searching for the perfect pirate shirt. Lace ruffles on the chest and cuffs add elegance to this button down style. Our Plus Size Francis Drake Pirate Shirt is made from rayon fabric. This shirt features a ruffle along the front of the shoulders as well as down the chest. A long ruffle at the cuff finishes the look. The Victorian gentleman was a true fashion plate. This shirt will be a favorite in your wardrobe. The high, turn-down collar is perfect for cravat or necktie, while the fold-over cuffs are made to accept just about any cuff link on the market. White 100% cotton of a comfortable fit. Our Festival shirt is a lightweight and comfortable shirt and is made from cotton gauze material, keeping you feeling cool and looking fantastic. The shirt features a Mandarin collar and a looped button-up placket front, which is great for either formal or relaxed looks. Small ruffles and a button closure accent the sleeves as well. This sharp shirt style was a favorite through the 18th century. The fashionable, loose fitting design made it easy to conceal daggers or purses. In swordplay, it allowed great freedom of movement. Cotton/Polyester blend for easy care. This shirt is available in black, white or red. This beautiful late renaissance shirt, available in purple, black or white, has a standing collar front and pearl buttons. The front ruffle has a three tiered cascading center with sheered long sleeves ending in pearl button ruffled cuff. A must-have for the well dressed lord. S, M, L, XL or XXL. Rayon, dry clean only. This Nordic inspired shirt features a lace up front, padded sleeves, and a Nordic -Celtic string design on the sleeves. It looks great worn alone, or under our buckled leather jerkin. 100% cotton. This stunning lady’s shirt has a single button high collar, which, along with the cuffs is accented with lace. 100% polyester, white only. This generous period shirt features an embroidered cross pattern on the collar with a hook & eye closure. Made of 100% cotton. Natural With Black Embroidery or Black with Red Embroidery. Available in S/M or L/XL. Our Pirate Captain's Ruffled Shirt is made from soft rich Rayon which is light weight and cool. The lacy frills on the chest and cuffs give it the perfect Pirate look. Will also work well as Renaissance era garb. Our Redbeard Pirate Shirt is made from thick and rich Viscose fabric. This V-neck pirate shirt has a drawstring closure in front. Sleeves are loose fitting with a small frill at the wrist. This Renaissance shirt features a stand up collar and lace up front. The sleeves are wide and roomy and end with an elastic gather. Available in Blue or Cocoa, Wine or Natural. 100% Cotton. This period cut shirt is made of a crinkled black polyester with a Tudor styled neck and dual hook & eye closure. Our John Nutt Striped Shirt has tight fitted sleeves below the elbow, which makes the upper part of the sleeves puffy. This cotton shirt is perfect for the sailor with a strong sense of style and a softer sense of morality. Our John Reckham Shirt, in rayon, has a single ruffle with eyelets & cords on the chest. The puffy sleeves have alternating portions of gathered & plain fabric. Our Patrickson Shirt is a collared rayon shirt made for the fashion conscious pirate. Long cords with loops have been provided down the front as well as on the sleeves. This button down shirt features a lace frill at the chest. In rayon fabric, you'll be cool and comfortable all day, through fair and feast. Our Metal Loop Country Shirt features metal loops down the front and sleeves, drawstrings run through for adjustability. This rayon shirt features a stand up collar, ruffles on the chest and cuff, and eyelets with lacing at the neck. Our Mary Read Blouse is made from thick rich velour fabric. It is short in front with a flowing back. Frilled eyelets in front and ruffled cuffs complete the renaissance look. Our McGreedy Blouse is made from rayon fabric. It has a fully elasticized shoulder and cuff. The front opening has ties, which allow the top to be worn with or without fastening. This cotton shirt is suitable for many period outfits. An authentically tailored Renaissance shirt with collared button neck, buttoned cuffs and billowed sleeves. Black. This Renaissance Collared Cotton Shirt, Black, XL is suitable for many period outfits. An authentically tailored Renaissance shirt with collared button neck, buttoned cuffs and billowed sleeves. This Renaissance Collared Cotton Shirt, Black, XXL is suitable for many period outfits. An authentically tailored Renaissance shirt with collared button neck, buttoned cuffs and billowed sleeves. The Pirate Shirt is made of 100% cotton which is soft to the touch. Our Renaissance Cotton Shirt Round Collar in Burgandy cotton is suitable for many period outfits including Medieval. This cotton shirt features a large round collar and lace closure. 100% pure cotton. Our Redbeard Pirate Shirt Plus Size is made from thick and rich Viscose fabric. This V-neck pirate shirt has a drawstring closure in front. Sleeves are loose fitting with a small frill at the wrist. Our Pirate Captain's Ruffled Shirt in Plus Size is made from soft rich Rayon which is light weight and cool. The lacy frills on the chest and cuffs give it the perfect Pirate look. Will also work well as Renaissance era garb. This Medieval Dress Shirt, in Plus Size, is a button down shirt which features a lace frill at the chest. In rayon fabric, you'll be cool and comfortable all day, through fair and feast. Our Noble's Medieval Shirt Plus Size is a rayon shirt features a stand up collar, ruffles on the chest and cuff, and eyelets with lacing at the neck. Our Patrickson Shirt Plus Size is a collared rayon shirt made for the fashion conscious pirate. Long cords with loops have been provided down the front as well as on the sleeves. This Plus Size cotton shirt has a round collar and buttons down to the waist. Lightweight, this shirt works as well under a doublet or vest as it does alone. Renaissance Cotton Shirt, a stylish, loose fitting design for ease of movement. Wear tucked in or belted. Short collar fastened with a tie as are the ornate wrists. 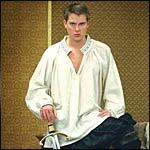 100% cotton, shirts will work as Medieval, Pirate or Musketeers Shirts. The swordsman shirt is a timeless renaissance shirt perfect for fairs, LARP and Cosplay. Medium weight cotton shirt tied cuffs, laced v-neckline collar and full length sleeves. A great look for pirates, swashbucklers and musketeers. Our Lady's Ruffled Pirate Blouse is made from 100% cotton fabric. It has a V-shape neckline with frills around the neck and down the front. Loose-fit sleeves have ruffles at the elastic wrist.